Apple’s Facetime feature for the iPhone 4 is already making waves in the deaf community because for the first time, two deaf people can use sign language to communicate with each other. FaceTime also lets hearing-impaired people supplement voice calls with video; features like lip-reading and facial expressions go a long way in aiding such calls. Now the FaceTime app just got a whole lot more exciting for the Deaf community. Apple has teamed up with ZVRS, a company that provides video relay services. Essentially, ZVRS uses human operators who are hearing and also fluent in American Sign Language. Thus, a Deaf person calls the ZVRS operator — known as a Communications Assistant — and he or she translates a conversation between a deaf and hearing caller using both voice and sign. Why is this so great? In the past deaf people have had to either buy a video cam or use a desktop or laptop; ZVRS is enabling the first on-the-go video relay service — and on the utterly cool iPhone, for Pete’s Sake. ZVRS is also good if the person on the other end doesn’t have an iPhone 4, because FaceTime only currently works between two people who own the phone. 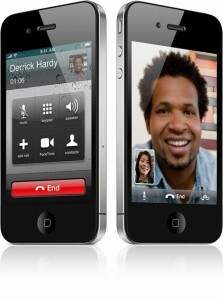 FaceTime currently works only on Wi-Fi networks and not over AT&T’s 3G. According to the San Antonio Technology Examiner, ZVRS is working around this and seeing how far the limits can be pushed on this application. The service will launch on July 26, the 20th anniversary of the Americans with Disabilities Act. Don’t forget, it was only a few years ago (light years, in tech terms) that deaf people favored the T-Mobile Sidekick because of it’s SMS and texting capabilities. Text, schmext. Video calls are the future, and the future is now.